sweet little kitty! Glad their doing okay! What an adorable picture! Wishing them a speedy recovery! Oh I’ve been thinking about them today! What a very sweet photo. I’m pleased they are safely home and tucked up in bed. What a cute photo! Glad they’re both recovering nicely. Good to hear they’re both doing well – if a bit sleepy. How are you holding up – have they made you feel good and guilty about the whole thing? oh my word is that your kittie bed?! that is just too much and too cute. glad the furry babies are home and healing. What a sweet picture! What lucky cats to have such comfortable beds. I hope they recover quickly from their surgery. 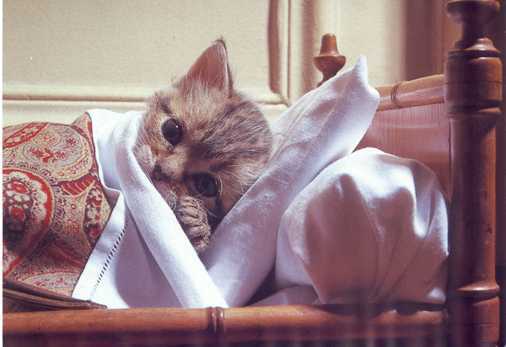 I gotta say the same thing everyone else said — cute kitty bed! Do they each have a kitty bed like that? You must have gotten the groggy kitty for that shot. Mine won’t cooperate for any kind of photography. That picture is just too adorable! Glad all is well!